Date written: The events of chapters 1-39 occurred during Isaiah's ministry, so they were probably written about 70 B.C. Chapters 40-66, however, may have been written near the end of his life, about 681 B.C. Special features: The book of Isaiah contain both prose and poetry and uses personification (attributing personal qualities to divine being or inanimate objects). Also, many of the prophecies in Isaiah contain predictions that foretell a soon-to-occur event and a distant future event at the same time. The Messiah who will come from the family of David to rule in righteousness. The military leader of His people. The Messiah who will carry the government on His shoulders. The One to whom all nations will eventually come. The One on whom one can safely build. The One who removes sin and impurity. The absolute standard of moral conduct. The powerful and sovereign Lord. The One who cleans away that which hinders or destroys. The One who frees His people by paying a price. The One who uses trials to remove sin as fire refines gold. The Person in whom one can find safety and protection. The One who is completely without sin and filled with absolute goodness. The Messiah who is descended from Jesse. The faithful Son of God who does His Father’s will. The Lord’s Servant will bring about justice for Jew and Gentile alike. The Lord’s Servant will be called from His mother’s womb to the task of restoring the tribes of Israel and bringing a light to the Gentiles. The Lord will give His Servant wisdom to withstand the attacks of His enemies. The Lord’s Servant will take upon Himself the sins of people. Word in life study Bible . 1997, c1996 (electronic ed.) (Is 53.5). Nashville: Thomas Nelson. Richards, L., & Richards, L. O. (1987). The teacher's commentary. Includes index. (378). Wheaton, Ill.: Victor Books. Jesus fulfills Isaiah’s prophecy of the Suffering Servant. New Geneva study Bible. 1997, c1995 (electronic ed.) (Is 53.6). Nashville: Thomas Nelson. Served as a prophet to Judah from 740-681 B.C. Society was in a great upheaval. Under King Ahaz and King Manasseh, the people reverted to idolatry, and there was even child sacrifice. Although judgment from other nations was inevitable, the people could still have a special relationship with God. 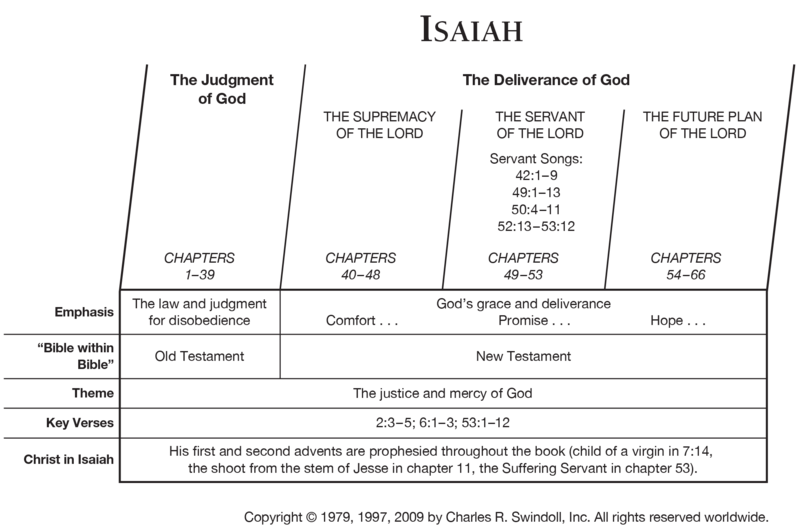 The 39 chapters in the first half of Isaiah generally carry the message of judgment for sin. Isaiah brings the message of judgment to Judah. Israel, and the surrounding pagan nations. The people of Judah had a from of godliness, but in their hearts they were corrupt. Isaiah's warnings were intended to purity the people by helping them understand God's true nature and message. However, they ignored the repeated warnings that Isaiah brought. We need to heed the prophetic voice and not repeat their error. The 27 chapters in the second half of Isaiah generally bring a message of forgiveness, comfort, and hope. This message of hope looks forward to the coming of the Messiah. Isaiah speaks more about the Messiah than does any other Old Testament prophet. He describes the Messiah as both a suffering Servant and a sovereign Lord. The fact that the Messiah was to be both a suffering Servant and a sovereign Lord could not be understood clearly until New Testament times. Based on what Jesus Christ has done, God freely offers forgiveness to all who turn to him in faith. This is God's message of comfort to us because those who heed it find eternal peace and fellowship with him.